Championship points leader Marc Marquez (Honda) took pole position earlier today at the Brno circuit. 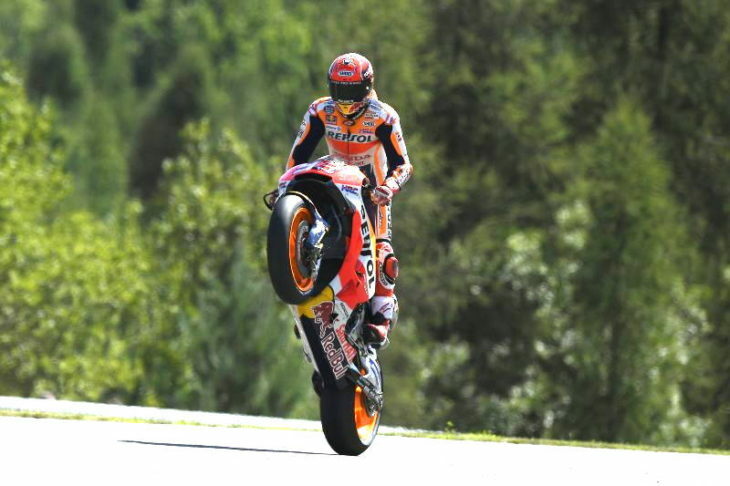 Starting on the front row with Marquez tomorrow will be Valentino Rossi (Yamaha) and Dani Pedrosa (Honda). There is a good chance of rain tomorrow. Jorge Lorenzo (Ducati) qualified in sixth position while using the unusual looking “downforce” fairing pictured in yesterday’s article. Lorenzo plans to use this fairing in tomorrow’s race, whether wet or dry. You can find full Q2 results here. NATCORK doesn’t explain consecutive 23rd-place qualifying positions, not when literally every other Ducati rider is doing much better. Redding is even qualifying below the KTM guys, and Tito Rabat. once you eliminate the impossible whatever remains – however improbable – WILL be the answer. no, what we find may (or may not) be something we desire/like/have a personal bias towards. that’s a separate issue. No, NATCORK doesn’t explain it. If the problem was solely the equipment, Redding wouldn’t be the only one dying out there. He’s consistently getting killed now by guys on 2015 Ducatis, among others, so the problem is either with Redding or his team. Watching Marquez save that crash in qualifying with his knee and elbow was worth the price of admission. Hope it’s a dry race tomorrow. What the hell has happened to Scott Redding? Q: What the hell has happened to Scott Redding?